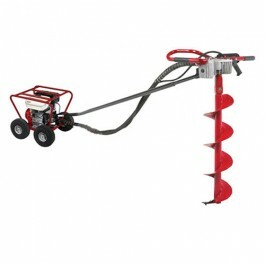 Dig clean, fast holes with the 8 HP Little Beaver mechanical post hole digger. This Earth drill features an 8 HP (7.9 net) Honda engine (GX-240) with 10" pneumatic tires and includes a roll cage. Auger sold separately. Post hole digger features a high horse power Honda GX-240 engine with 10-inch pneumatic tires. Includes a roll cage. Auger not included.